Mountain Resort Properties is family owned and operated, specializing in offering the very best of Sunriver, Oregon vacation rental homes and vacation rental condos, Sunriver property management services and Sunriver real estate options. Need a pet friendly vacation rental? Relax and enjoy one of our many Pet Friendly Sunriver Rental Homes. From studio rentals to five bedroom executive home rentals, we can accommodate your entire group and your pets in a clean and comfortable Sunriver Vacation Rental. From cozy cabin rentals to elegant vacation rental homes, we can arrange accommodations for any size group. Planning a family reunion? 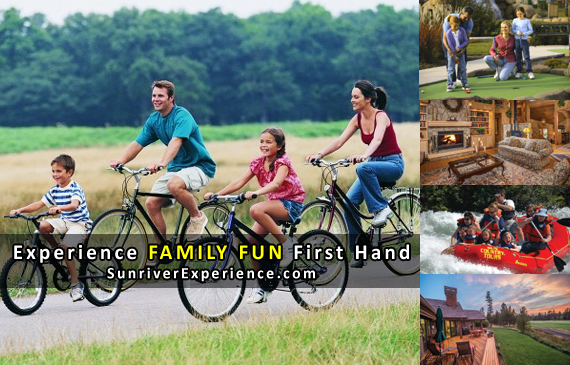 We have put together clusters of Sunriver vacation rental homes that are close together and that have been proven to work well for large groups and family reunions. We have put together clusters of Sunriver vacation rental homes that are close together and that have been proven to work well for larger groups. Sunriver Vacation Homes and Condos managed by us have a reputation for cleanliness and comfort. Our guests return to Sunriver Vacation Rentals with Mountain Resort Properties year-after-year knowing they will arrive and check into a well maintained, trouble free vacation rental. As a founding partner of Sunriver Vacations, we offer exclusive amenities. As our guest we can provide you with preferred tee times & discount green fees at Lost Tracks Golf Club as well as unlimited access to Mavericks at Sunriver, our newest 32,000 + sq. ft. indoor family recreation and fitness center, voted "Best Business" in 2005 by The Sunriver Chamber. When you visit Sunriver - Central Oregon - Mt. Bachelor Ski Resort, you can count on high desert sunshine, low humidity and an arid climate. Sunny, clear days and cool nights create enjoyable weather all year for visitors to enjoy, and with less than 12 inches of precipitation and 300 days of sunshine a year.